I snipped the last leaves of sorrel off the plant on my porch this morning. We’re on the verge of the first frost in Philadelphia and I’m harvesting the last of my summer herbs. I used leaves from this same plant for the delicious savory snack “Sorrell with Eggs” over the summer. 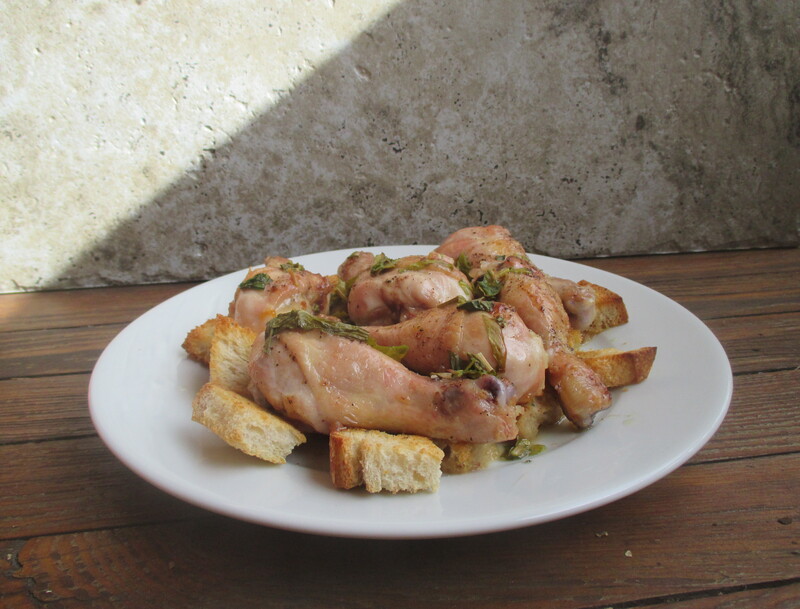 I’ve had this recipe for “Chicken on sorrell sops” bookmarked for ages. 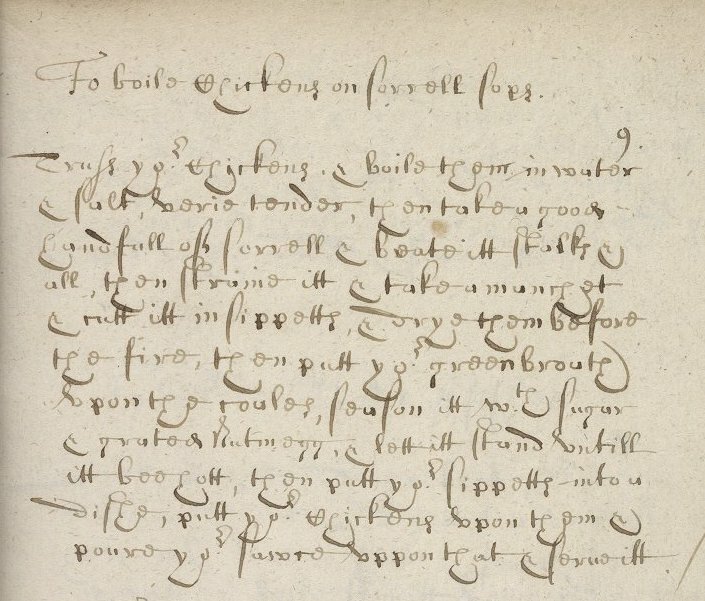 It’s from one of the oldest manuscripts in the UPenn Kislak collection, MS Codex 1601, and Alyssa and I made “A tarte of green pease” from it a while back. Cooked chicken, toasted manchet bread croutons, and sorrel sauce sounded like the perfect combination for a chilly fall day. poure your sawce vppon that & serue itt. I’ve taken some liberties to update this one. 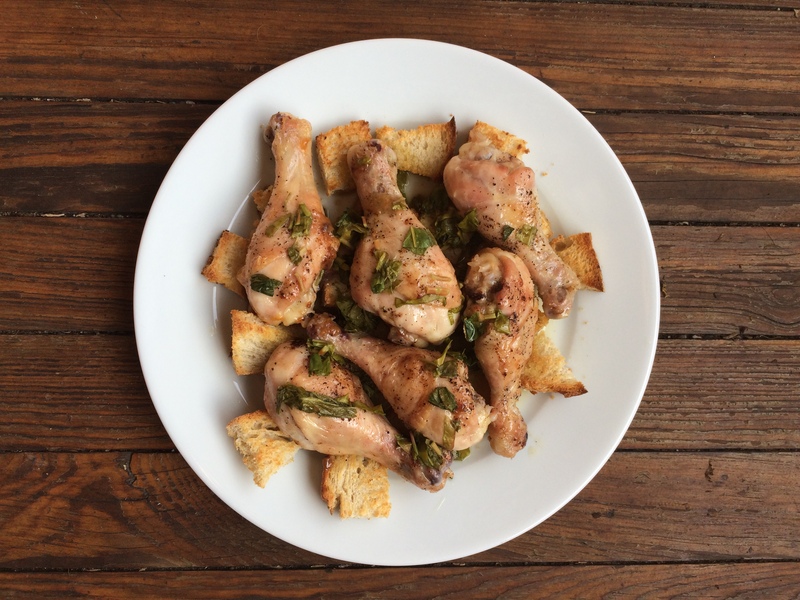 I used chicken legs for this recipe because I love them and I had them around, but you could use a whole chicken. I roasted the chicken following a favorite Mark Bittman recipe, but you could boil it as the original suggests. For the “manchet” bread, I used pan levain from my local bakery, but you could use any bread. To create more delicious sauce, I added stock to the sorrel and seasonings. If I had more sorrel, or peak summer sorrel, it might have produced a juicier sauce all on its own. Heat your oven to 450F. Put your chicken legs in a roasting dish with butter or olive oil skin side up. Season them with salt and pepper. Bake for 15 min. Flip the legs over, bake for about 10 minutes. Flip the legs a third time so the skin side is up once again. Put the croutons on a baking sheet and put them in the oven as well. Bake everything for another 10 minutes until the chicken is cooked and the bread begins to brown. When you put the bread in the oven, heat your stock to almost boiling in a small saucepan. Lower the head and add the sugar, salt, nutmeg, and sorrel. Turn the head down, but keep this sauce warm until you are ready to use it. To serve, layer the bread pieces on a plate or platter. Then arrange the chicken on top. I also poured the pan drippings over the chicken and bread. Finally, pour on the sorrel sauce. I knew I liked the sound of this recipe the first time that I read it, but it is a delicious, comforting dish. A deconstructed chicken with sauce-soaked croutons and herbs, this chicken recipe is perfect for a fall day. My apartment is toasty and smells like chicken. I’m about to go back for seconds. 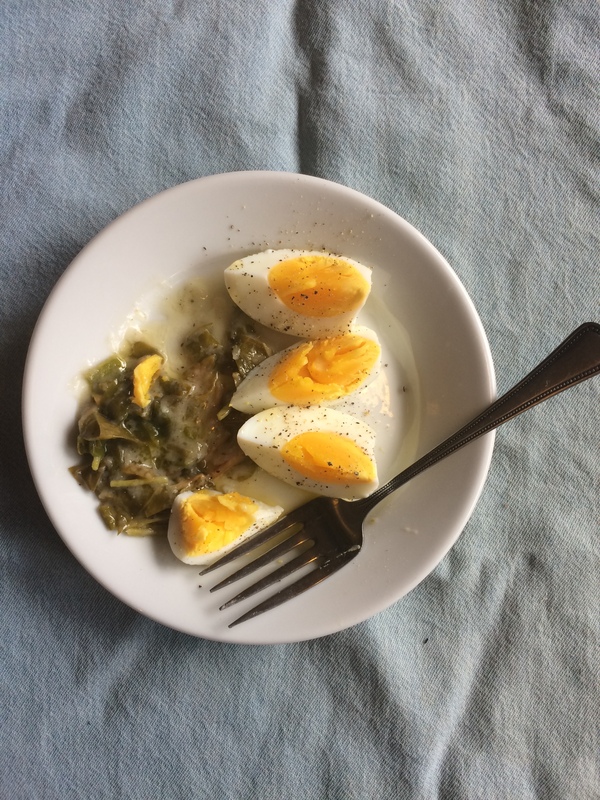 Sorrell with Eggs – For a Plate. And the other in the side of the Dish. 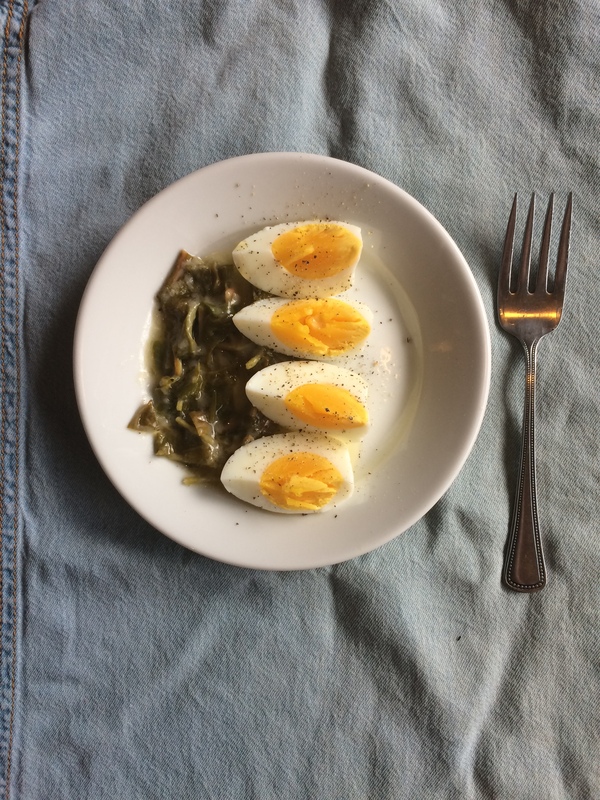 Lemony sorrel leaves are cooked with butter and spices, sauced with clarified butter, and served with a hardboiled egg. The note “For a Plate” and the final instructions for garnishing suggest that this dish would have appeared on a banquet table among other cold, highly-seasoned dishes. Put the remaining 1T butter in a small pan over a low heat. Add the sorrel, flour, and spices. Stir to combine. The flour will thicken the sauce to form a light gray. I added a little water during cooking to thin out the mix. When the sorrel is cooked down and the mix smells good, remove from heat. This took about five minutes for me. Plate individual servings of the sorrel mix on small plates. Add the butter. Peel and cut your egg into quarters. Artfully arrange your egg quarters so the one end is on the sorrel mix and the other end is on the plate. Season your egg with freshly ground pepper to taste. Take a photograph because it’s so pretty. Snack away. I will likely make this again. The sharp sorrel is delicious with the buttery sauce and the yielding egg. The nutmeg adds an aromatic note. And, a bonus, the cooking process didn’t take long or make the apartment unbearably hot.